This was surprisingly easy to unpack. Everything is already assembled, just unfold! The wood quality is good with very few rough edges. Felt pads are commended for the chair legs, however, as within a month they had worn down some of the finish on my wood floor (reparable with wood finish markers.) Compact and comfortable, attractive set just the right size for apartments and balconies. 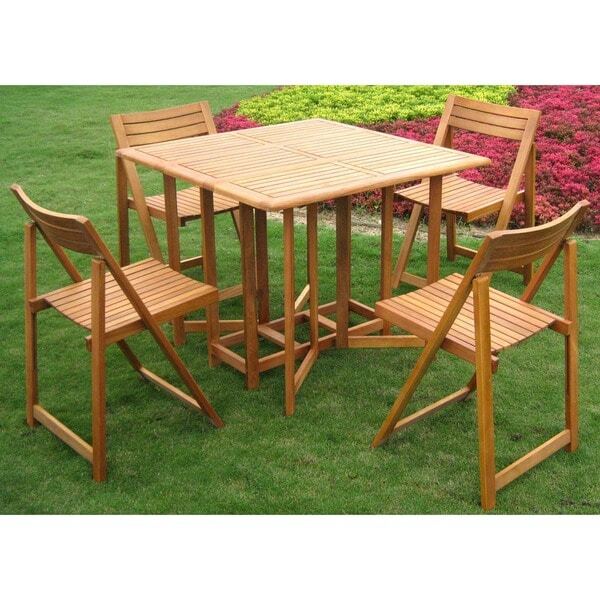 Surround yourself with tranquil natural scenery at mealtimes with this Royal Tahiti folding outdoor dining set. The set's slatted construction and rich golden grain showcase the beauty and hardiness of yellow balau hardwood, and this folding outdoor dining set is treated with teak oil to offer lasting protection from UV rays and weather damage. Conveniently drop down the table leaves, and pack up the folding chairs for easy portability or seasonal storage. Living along the Florida coast, we have to be careful what we purchase because of heat, sun and rust. This outdoor dining set seemed like a perfect option for us because it folds up with the chairs underneath. Our covered porch is long, but only 8 feet wide and is on the west side of the house that will only get late afternoon summer sun. We had an old grill cover that covers it perfectly due to the pollen season that has already begun in February. It seems well constructed, is sturdy and we have used it numerous times in the month that we have had it. Time will tell. We liked it so well, we purchased side tables several weeks later and have stripped our five rocking chairs, re-staining them to match the dining set and side tables. We are ready for spring and summer. When we first got this item, we were very pleased. Functionally, it is a good design, with the only caveats being the lack of wheels to move the table and the fact that 2 people will have to be very careful about how they sit to avoid banging into the table legs. However, it has been roughly one month since purchase and three or four thunderstorms later and we are much less pleased. The table edges are already starting to crack. The movable table legs that support the 2 side leaves are showing signs of bending. Since this item is intended to be an outdoor product and I am planning to store it on my deck through the winter, I find it amazing that this product is already starting to wear. So much for this wood being as strong as teak. I do not recommend this product at all. Save your money and buy the real thing. I'll no longer be buying furniture from Overstock. Arrived in heavily damaged box, dropped off in driveway when I wasn't home. I went ahead and repaired the significant breakage with gorilla glue. Item looks GREAT but it is not the super hardwood, teak-equivalent as advertised. You can indent the wood simply by pressing hard with your fingernail. ...but it does look great and functions as advertised. Because some of this is glued together, I won't be leaving this out in the weather- I plan to stow it indoors come winder time. We experienced some shipping issues which were alleviated in a very timely manner. The outdoor dining set is an excellent addition to our deck, we are very happy with it. This set is perfect for small areas in or outside the home. Cute little table so easy to assemble and great value. It will store neatly in a small, limited space. "Can you use the table with one side folded down?" Thank you for your question, movn2. We do not recommend using the International Caravan Royal Tahiti 'Galveston' 5-piece Stowaway Outdoor Dining Set with one side folded down, due to the risk of the table turning over. Have a great day. "Is there sufficient leg room for all four people?" Thank you for contacting us bitbrit. Yes, this is designed for 4 people to sit in. Please let us know if you have any further questions. "what is the weight limit of the chairs?" Hello dtf1219, This dining set has received excellent reviews! The chairs can hold up to 225 pounds each. I hope this information helps. Thanks for shopping with us.